Given it was option expiration on Comex this week, gold and silver performed well. One would have expected the takers to mark prices down to make as many call options as possible expire worthless. As it was, gold traded in a narrow range all week, between $1245 and $1255, before dipping slightly yesterday in late trade to $1242. 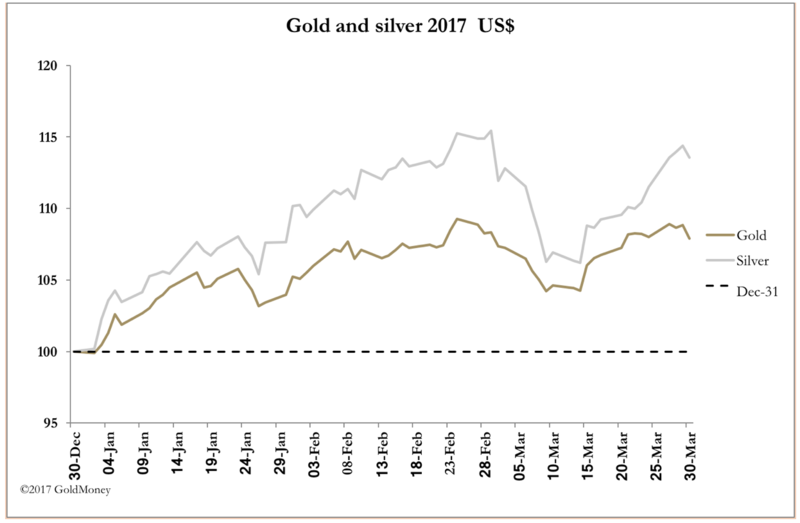 Silver meanwhile outperformed gold. In early European trading this morning (Friday) gold was at $1242 and silver at $18.09. 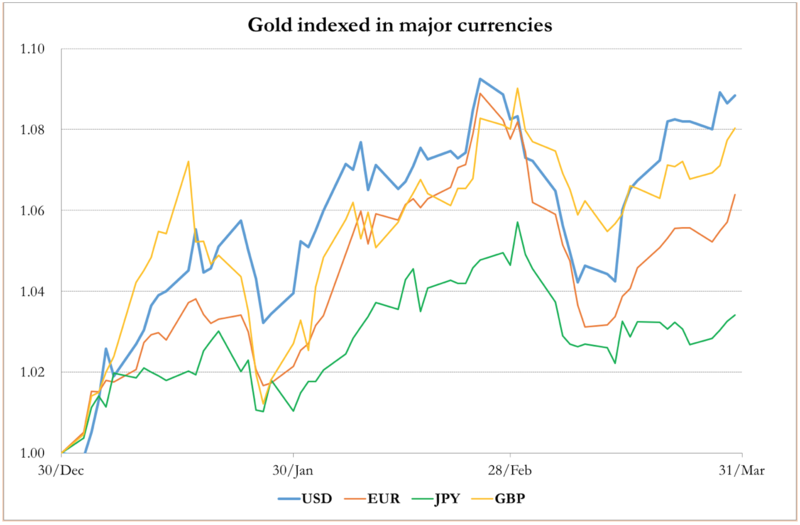 The April futures gold contract is running off the board, and one would expect the bullion banks to shake out the speculators with long positions. Most have rolled over into the June contract, but remarkably, some did not, choosing to close positions, with no damage to the price. As a result, open interest has decreased significantly, which is evident in the next chart. To see open interest fall so sharply, without a significant price decline, is unusual. The last time this happened was in December after the Fed put up the Fed funds rate. It is similar today, following the March FFR increase, and coincides with an overriding factor, the decline of the dollar. The dollar rallied strongly after the Trump victory and before the December FFR increase. It subsequently fell against other major currencies before recovering somewhat ahead of the March FFR, and has fallen subsequently. It is not the gold price that’s moving so much as that of the dollar. Priced in other currencies, gold’s performance this year has been less dramatic, shown in our third chart. Therefore, we can conclude that technical commentary on gold is better redirected to the dollar. Now that the distortion of an anticipated rise in the Fed funds rate is behind us, the outlook for the dollar is deteriorating. There is a worrying decline in outstanding Loans and Leases, though bank credit growth remains above trend, though slowing. This probably indicates that borrowing is for financial activities, and not production. More importantly, the emotional credit invested in President Trump after his election is deteriorating rapidly. The President’s recent failure to persuade congress to ditch Obamacare has ruined his whole agenda, at the worst possible time. The end of the suspension of the debt limit eliminates the prospect of any further borrowing, and until President and Congress can agree on a new limit, the administration will have to rely on financial engineering, before descending towards insolvency. So forget the price of gold measured in dollars, it is the dollar itself that’s the problem. Silver has been on a different technical trajectory, following base metals and some demand that’s hard to identify. Look at the next chart, of open interest, and see how different it is from that of gold. Open interest is rising strongly relative to the price, and indicates that silver is overbought. Is someone trying to corner the market, is there a pick-up in commercial demand in a tight market, or does it reflect pure speculation? In favour of the first two alternatives is silver’s impressive performance. If speculation was involved one would expect bouts of profit-taking intra-day, which is not happening. The test will come in the second half of April, when the May contract begins to run off the board, and ahead of option expiry.